Online casinos are adding more and more online fruit machines to their portfolio of slots. The latest addition to this quickly expanding collection is 5ive Liner, an ex-JPM fruit machine that was hugely popular in the 1990’s. When any serious developer, especially JPM, transform their real life projects into online games, every aspect of the original version is copied to capture the whole essence of the machine that was experienced all those years ago. The gameplay of 5ive Liner is very smooth and the reels fall seamlessly into place each spin, with the original sound effects making an appearance that will be sure to attract the old brigade and new generation of players alike. As with all pub/club style slots, there is a feature board that is accessed by landing a win or by climbing the trial by hitting numbers on the payline. The slot has 3-reels and 5-lines with both the trail and fruit win will trigger the high/low style feature board, where players are met with a ladder of cash they can climb to reach the jackpot. This jackpot feature is similar to those you’d find on classic fruit machines such as Rainbow Riches or the ever popular Reel King. The ladder of cash is incremented by one whenever a correct high or low decision is made on the current number (1-12). Once again, the sounds have been taken directly from the original machine as have the illuminations and special effects. A special bonus can also be awarded on specific numbers which can increase the chances of prolonging the time on the feature ranging from an extra life to a “no lose” number. Within the special bonus, players have the opportunity to collect three keys and trigger the super feature board. This roulette wheel style game offers players to multiply their current winnings up to x10: therefore it has the potential to pay more than the standard jackpot. You might also want to check out JPM Turbo Gold or JPM Full House, which are other new fruit machines from the JPM brand. This slot that JPM has brought to life really does capture the excitement it brought to so many players all that time ago. It isn’t brimming with action packed bonus rounds or super special free spins rounds, but the slot still has a certain character that will make it true JPM protégé. 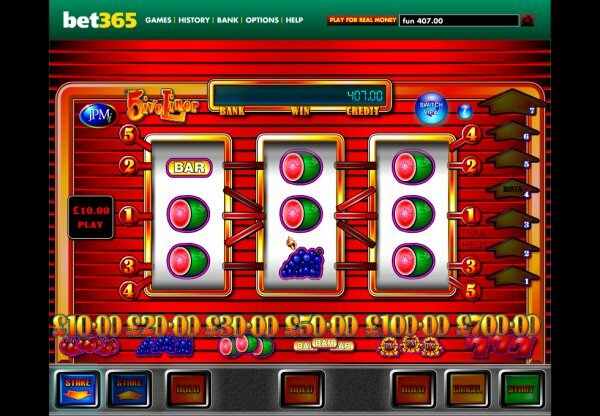 5 Liner is currently exclusive to Bet 365 Games, a section on the Bet 365 site with hundreds of slots and fruit machines. Visit Bet 365. If you like JPM fruit machines, make sure you check out or section on Barcrest slots.